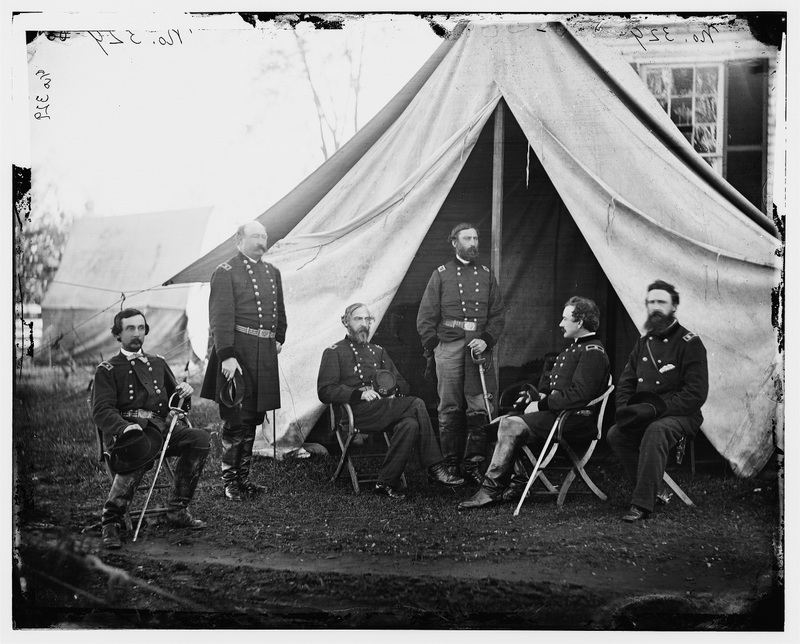 This image, taken in September 1863 outside Culpeper, shows Meade with several of his generals. From left to right we have Gouverneur Warren, then in temporary command of the II Corps while Winfield Scott Hancock recovered from his Gettysburg wound; William French, commanding the III Corps; Meade; Henry Hunt, the army’s artillery chief, chief of staff Andrew Humphreys; and George Sykes (V Corps). In his letter home on November 1, Meade remains defensive about his recent operations. He knew that President Lincoln and General in Chief Henry Halleck were not happy with the results, but he felt they should remove him from command if they thought someone could do better. Yet when he did propose a plan of action—an attempt to flank Lee’s army by crossing the Rappahannock at Banks Ford and Fredericksburg—Lincoln refused permission. Perhaps Meade’s projected strategy aroused bad memories of Ambrose Burnside’s disastrous campaign, but almost certainly the president worried that the movement risked leaving Washington exposed. It’s interesting to speculate, though, what would have happened had the Army of the Potomac been in Fredericksburg in the spring of 1864 instead of having to fight its way through the Wilderness. Within the army rumor had it that Meade was going to be replaced. “Candidly, we feel every confidence in Meade, and if anyone succeeds him but McClellan, the dissatisfaction will be intense,” noted one officer. There is no doubt my failure to engage Lee in battle during his recent advance created great disappointment, in which feeling I fully shared. I have seen and heard of no indications of absolute dissatisfaction, though this may have existed without its being manifested. The General in Chief did telegraph me I had better fight instead of running away, but as he did not explain how I could fight to advantage, I paid no attention to the very rough manner in which he expressed his views, except to inform him that, if my judgment was not approved, I ought to be and deserved to be relieved; to which I received no reply beyond a disclaiming of any intention to give offence. Now I have clearly indicated what I thought feasible and practicable and my plan is disapproved. I think under these circumstances justice to me and the true interests of the country justify their selecting some one else to command. Meade’s correspondence taken from The Life and Letters of George Gordon Meade, Major-General United States Army, Vol. 2, (New York: Charles Scribner’s Sons, 1913), p. 155. Available via Google Books.